Yes, race date is on Good Friday. We’re going to make this a very family friendly race with a new “cross country” (on flat grass in the park) race for the kids. There will be activities for the kids including a bouncy castle and some fun Easter surprises. And the 5 km is stroller and dog friendly! The 5 km will start 15 minutes after the 10 & 15 km to allow the 10 & 15 km runners to complete the first loop before congesting it with strollers and dogs. Dogs on leash only please. 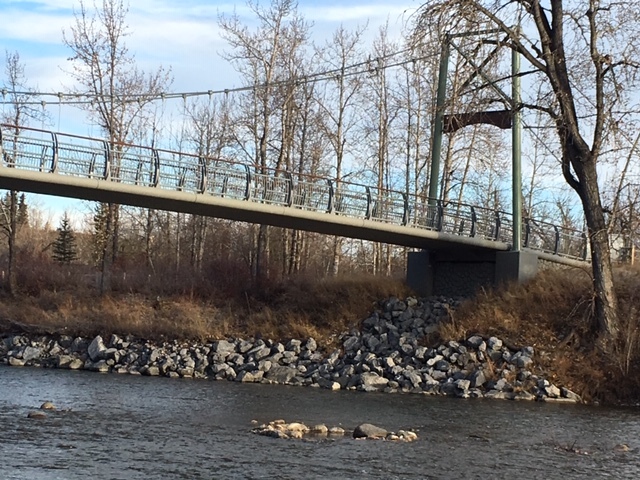 Come “run the bridges” on Easter weekend. The new start and finish at Stanley Park will utilize pathways in the Stanley Park, Sandy Beach, River Park area. 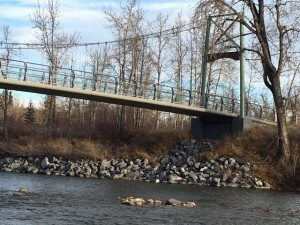 This allows a unique route which will take advantage of the new post flood bridges over the Elbow River. The 5 km route will cross one bridge, the 10 km will cross two and the 15 km will cross all three bridges. There is free parking in and around the park. Your entry fee includes a tri-blend t-shirt, finishers medal, post race lunch with an assortment of Mr. Sub sandwiches and Old Dutch chips, $5.00 beer and all of the activities for the kids. The kids run is open to all ages and wee ones can run with mom and/or dad if you like. There is no charge for parents to run with their kids. There are medals for the top three finishers in each 10 year age group. Warm up after winter with your choice of distance! There is nothing like the first race of the season to get rid of the winter blues. Here is your chance to get started early with a warm up race of 5km (stroller and dog friendly), 10km, or try the unique 15km distance. Race package pick up is at Gord’s Running Store (919 Centre St NW) on Wednesday, April 17 and Thursday, April 18 from 4:00 p.m. to 7:00 p.m. If you’re also doing Spring Trio Trail, you’ll be able to pick up both packages on this day. Updated. Click here for important race day info. Click here for parking options. Parking is free in all of these locations. Coming from out of town and need a hotel room? The Sandman Hotel Calgary Centre is offering a special rate for Spring Trio participants. Click here to see details and booking information. 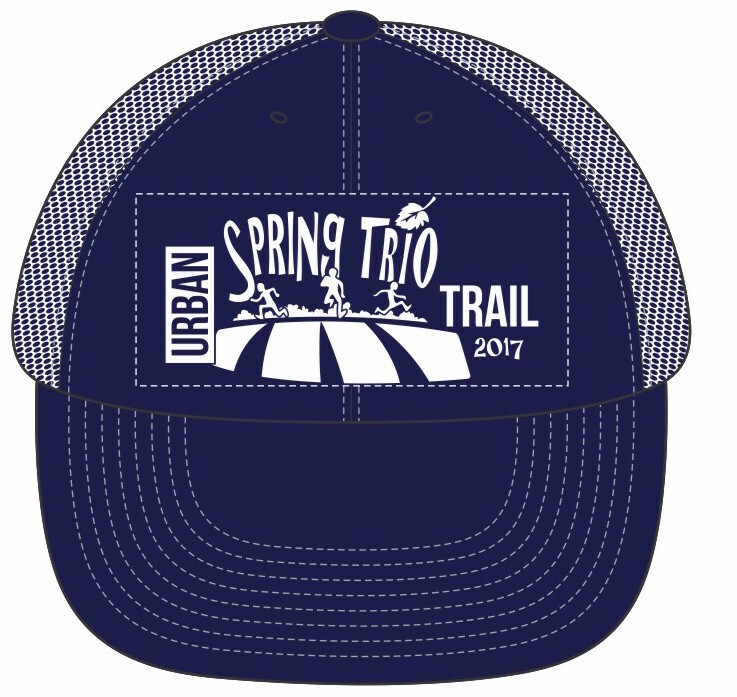 Check out our Spring Trio Trail race (learn more on our Spring Trio Trail page). Tackle the pathway version from Stanley Park then the trail version from Sandy Beach. 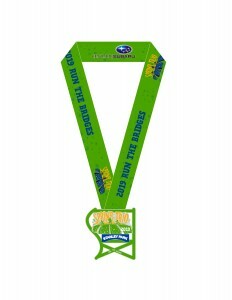 We’ll have some super swanky finishers medals that will go together to make an even cooler medal if you do both races! Watch for those to be revealed shortly. People who do both races will also receive a commemorative “double header” campfire mug.